Crew Tether Spin - With Final Stage - On Routine Mission To ISS - First Human Test Of Artificial Gravity? You may remember, a while back I talked about Joe Carroll's ingenious idea to do our first ever true experiment in a gravity tether during a routine Soyuz crew transfer to the ISS, His idea is to use the third stage -which goes into orbit anyway, as the counterweight. Remarkably, the whole thing, even including the spin up to create artificial gravity, uses almost no extra fuel over a normal mission to the ISS. This could help with numerous health issues of zero g.
Simulation of a tether spin in Orbiter, 600 meters, 1 rpm as in Joe Carroll's suggestion. Orbiter is a remarkable space mission simulator by Dr. Martin Schweiger with lots of add ons contributed by enthusiasts. The research on Earth so far seems to suggest that most people even if highly susceptible to spin motions can probably tolerate this fine, and it would simulate lunar gravity - but we won't know for sure until the experiment is done. The dot a quarter of the way along the tether which you might just make out when you show it full screen isn't a feature of the experiment, but just a symbol to show the position of the center of gravity. Shows Soyuz immediately after separation from its final stage (screenshot from Orbiter simulation as with most of the screenshots on this page). Both are in orbit at this point. The idea is to use a pre-attached tether which unfurls as the spacecraft separate - a method tested in many missions now - though only twice before used to generate artificial gravity, microgravity only - in the Gemini missions. "Joe Carroll has worked since 1981 on advanced space transportation, mostly involving long tethers. He led the development of the Small Expendable Deployment System (SEDS), which demonstrated controlled deorbit without rockets in 1993 and also flew successfully on SEDS-2 in 1994, and TiPS in 1996. He also developed the deployer and wire for the Plasma Motor Generator (PMG), which demonstrated electrodynamic thrust in orbit. He has also worked on unmanned and manned reentry vehicle concepts for NASA and several startups. His main current work is on electrodynamic tethers." For some of the many possible benefits of this experiment, see Can Spinning Habitats Solve Zero g Problem? And Answer Low g Questions? The most remarkable thing about these artificial gravity experiments is ,that they haven't been done before. True, it wouldn't be the first tether experiment to generate artificial gravity, that was Gemini 11, but that only generated micro gravity. The tether experiment video starts at about 10.30 minutes into the video. Then we also have the Gemini 8 uncontrolled spacecraft spin - but neither of these were intended to create artificial gravity and were not proper experiments in effects of spin and artificial gravity on humans. Actually there were many plans for artificial gravity in space in the 1960s, in the run up to the Apollo landing, including ambitious plans for spinning habitats in space, but eventually they were all dropped in competition with the lunar program and were never built. See From Sputnik to Skylab, in Theodore Hall's dissertation on artificial gravity. It's astonishing that, fifty years after Gemini 11, we still have no data on how humans respond to the spin rates needed to create artificial gravity, when they are in space conditions. Experiments on Earth are not the same, because they can't simulate the space conditions exactly, and there's some reason to suppose that humans would respond differently in a spinning tether experiment or centrifuge in space. It's not just a matter of comfort and convenience. Humans have numerous health issues in zero g. see for instance, The body in space and Health in space, and some chapters from Laboratory Science with Space Data: Accessing and Using Space-Experiment Data, and Wikipedia on effects of weightlessness. Most of those problems clear up a few months after return to Earth, and some clear up almost immediately on exposure to full gravity. Bone loss takes longer though, it can be several years before your bones return to their normal strength after a long duration spaceflight. It's hard for humans to last in zero g for longer than a few months without a vigorous daily exercise regime. Only a few Russian cosmonauts have spent more than a year in zero g, while no astronaut from any other country has lasted a year in zero g. So far, nobody has yet spent two years in zero g, and the human body is so complex with many changes in its function in zero g. Medical opinion differs on this, but at any rate nobody can yet say for sure that humans can survive two years of zero g.
We have no idea how much artificial gravity humans need to solve these issues. How, realistically, can we hope to create good designs for long duration human missions without this information about the spin rates that humans can tolerate, or the levels of artificial gravity needed to overcome the health issues? Joe's idea is to do the mission during the early "phasing" stage of the approach to the ISS, when the Soyuz is still several hundred kilometers below it, and gradually catching up in its lower, and so faster orbit. In the past, the Soyuz took 2 days to reach the ISS or MIR as it gradually catches up with it and then matches orbits. Nowadays, with Progress, they can get there with just a few of hours phasing time - not long enough to do more than a short token experiment. First, the simplest way to do it is you have the tether pre-attached from the Soyuz TMA to its final stage. Then we can arrange it like the Gemini, tether, in folds, lightly stitched together so that it will unfold easily when the craft separate. In what follows, let's call them the Soyuz and the final stage for simplicity (though technically both are Soyuz spacecraft, the TMA and the FG). This image shows the various stages of the launch. Here is a speeded up launch of the Soyuz, which I recorded in the Orbiter space simulator. It goes as far as the separation from the final stage. After the solar panels unfurl. At this point the two spacecraft are in the same orbit, and Joe's idea is to have them tethered to each other. It's better to wait until we are over the Pacific before we start to spin them up, as we'll see. You could do a gentle spin at this stage, enough to have some tension in the cable, with microgravity, similar to the Gemini experiment. Here we see them spinning, with a gentle spin. I've done a 50 meter tether - see later, idea for varying the length with releasable ties - the square box in the centre is just a marker to make it easy to see where the c of g is - and for the camera to point at - could make it invisible but I thought was nice to see where it is. Actually, this length of tether might be of interest for studying the effects of very low levels of gravity on humans - or high spin rates also. More on this later. Tou can use the same method with any rocket launched mission with a final stage that goes into orbit. So, you could use the same method with the SpaceX Dragon and Falcon-9 - whenever SpaceX are able to get it qualified to take human crew. Similar ideas could also be used for lunar missions and interplanetary missions, because they also have final stages. With interplanetary missions, then again, the final stages often end up on similar orbits to the spacecraft themselves. Indeed, for many missions to Mars you have to be careful to make sure the final stage doesn't hit Mars and contaminate it, through trajectory biasing. (Depends on the mission, the Indian Mars Orbiter Mission is an exception as it used a series of Earth flybys to get to Mars with minimum expenditure of fuel). One interesting idea for interplanetary missions, the delta v in an interplanetary tether spin can be used as an abort scenario for a mission to Mars. If you set up the tether spin right, you can boost straight back to Earth - in an emergency - by cutting the tether at the right moment in its tether spin when it reaches Mars. For the launch sequence I chose a mission that launched in daylight so you could see it better. But for this second phase , I've chosen a mission that launched in the dark, so we can have full light over the Pacific for the next image. As you see, it launches over Russia - and that's where it has its perigee - closest point to Earth. It's highest point, the apogee, is over the Pacific ocean, just before it passes over South America. The idea is that you always do the burns when the Soyuz is over the Southern hemisphere, at its apogee, and do them as short burns, at the right moment in the tether spin each time. You always do these burns when the Soyuz is moving forwards in its tether spin, in the direction of the orbit. That way, the burns spin up the assembly, and raise the orbit of the assembly at the same time, so no fuel is wasted. If you did it half a tether spin later, when the Soyuz is travelling backwards in its orbit relative to the center of gravity, the boosts would lower the orbit and so waste fuel. By doing the burns always in the southern hemisphere, you leave the altitude of the southern part of the orbit unchanged, as it's high enough already. You raise the orbit at its lowest point, over Russia. This raises it out of the lower atmosphere and reduces drag. There's another reason for doing it like this as well, which we'll come to in a minute. When we start on these boosts, the ISS, is over a hundred kilometers higher in altitude, and our Soyuz is nearly a complete orbit behind it. It will be two days before the Soyuz approaches the ISS. Joe Caroll suggests a 600 meter tether. The final stage weighs a third of the weight of the Soyuz. This puts the centre of gravity of the assembly 150 meters away from the Soyuz, and 450 meters away from the final stage. This lets you generate artificial lunar gravity with spin rate of 1 rpm. At that rotation rate the Soyuz has delta v of 15.6 m/sec, the final stage travels at three times that speed, and the speed of the Soyuz relative to the final stage is four times that, 62.4 m/sec. If the Soyuz wasn't attached to the final stage, that would be enough to boost the altitude in the Northern hemisphere by 213 km. But since it remains attached to the booster, the Soyuz has 3/4 of the mass of the system, and the combined assembly gets boosted only 160 km approx (3/4 of 213 km). For a concrete example, Joe Carroll took the orbit used in May 2013, with MECO (Main engine cut off point) at apogee 225 km and perigee 193 km. The part of the orbit where you do the burns doesn't change its altitude. But the original perigee over northern hemisphere (originally Russia) is boosted until eventually it becomes the new apogee at about 353 km. The end result is an orbit with apogee 353 km and perigee 225 km, and a spinning assembly with delta v of the Soyuz of 62.4 m/second relative to the booster. There isn't much drag, because by the end of the experiment, most of the orbit ends at a reasonably high altitude of 353 km. This is still well below the ISS, which will stay above 380 km for the next few years at least. He works out that the 600 meter tether slowly spinning has average frontal drag of about 12 m2. The total assembly he estimates at average frontal area of 36 m2. He works out the total fuel needed to compensate for this extra drag as about 3 kg of fuel per day for duration of the experiment, which isn't that much. The tether mass then about 20 km and those two together he thinks may be the main extra masses needed for the experiment. The most clever part of all this comes when you release the tether. We want to deorbit the final stage over the empty Pacific. So wait until the Earth has rotated around beneath the orbit, so that the southernmost part of our orbit lies over empty parts of the Pacific ocean. Now release the tether at the apogee, at 353 km, which we remember, was in the Northern Hemisphere over Russia - and do it when the Soyuz is moving forward in direction of the orbit, and the final stage, of course, is moving backwards. If we do it like that, then all the delta v released boosts the Soyuz to a higher orbit - and simultaneously puts the final stage to a lower orbit. Since we do this at apogee, then this is unchanged after tether release, 353 km. When you work out the figures, it turns out that the Soyuz gets boosted to 353 km varying to 278 km. The final stage ends up in an orbit of 353 km varying down to 68 km. This 68 km is low enough so that the booster will immediately re-enter at its next perigee, so that's how you get the targetted re-entry, for instance you could set it to re-enter into the empty Southern Pacific ocean not far from Antarctica.. The Soyuz is now in an ideal orbit for its final stage of phasing to reach the ISS at the right point in its orbit. The interesting thing to notice in these figures is that the final stage is in an orbit with the same gravitational potential energy as the Main Engine Cut Off Orbit (MECO). The final stage after release has sum of perigee + apogee of 353 + 68, or 421 km, and it originally had 193 + 225, or 418 km. This means, the longest diameter of the ellipse has hardly changed at all. So, since total energy of an orbit, KE + PE, is inversely proporitional to the semi-maor axis, the energy of the final stage ends up pretty much exactly the same as it had originally. This shows that just about all the energy of the boost has gone into raising the orbit of the Soyuz. Almost no fuel has gone wastefully into boosting the final stage. That's why we get the experiment essentially for free, no extra fuel is used over the amount that would be used to get to the ISS anyway, except a tiny amount to deal with extra air resistance during the flight. You want solar power for the duration if at all possible, so the experiment is not limited in duration by the capacity of the Soyuz batteries. So, the panels need to be extended while the Soyuz is spinning. This means, they need to stand up to the level of artificial gravity targeted - either lunar gravity, or full gravity if you try full gravity tether experiments. That's a matter of the details of construction of the solar panels. It seems reasonably likely it could withstand lunar gravity and maybe withstand ordinary gravity as well. I looked to see if there are any images of it with its solar panels deployed on the Earth - which would mean it can definitely withstand full g deployed solar sails but can't. Anyone know more about the details of the construction of the Soyuz solar panels? The amount of solar power you get depends on the time of year you do the experiment - what matters is the amount of time spent in shadow for each orbit - and that in turn depends on the solar beta angle - which is the angle of the plane of the orbit to the sun. When the solar beta angle is high then the satellite is in sunshine nearly all the time, with plenty of solar power. At the 51.6 degree inclination of the ISS, the maximum beta angle is is 51.6+23.45 = 75.05. Anything with beta angle over 70 degrees is in sun all the time at 400 km altitude. A beta angle of 45 degrees is easy to achieve, most orbits have that much. You can also do tracking of the sun rather simply, by rotating the Soyuz around the line of the tether. With these two combined, you get an average of over 85% illumination of the panel (between 71 and 100%). I asked him if it could accommodate a higher rpm. I'm especially interested in really high rpms such as 3 rpm, or 6 rpm, perhaps even 9 rpm, as there seems good evidence that humans might be able to tolerate these - perhaps far better than earlier experimenters thought. This video shows the Skylab astronauts on their jogging track. Jogging starts at 3.30 into the movie. It was just done for fun, not as a scientific study. They certainly don't seem to be under any distress jogging around at about 12 rpm, and generating 0.5 g approximately. The Coriolis effect probably makes them more clumsy than they would be otherwise, but you'd adjust to that if you were spinning all the time. This evidence includes the experiments with skylab with the rotating litter chair moving in sinusoidal patterns plus rocking back and forth. Then there's the Gemini 8 out of control spin - the only time that astronauts experienced hypergravity as a result of a spacecraft spin. Both were sick afterwards, but they were able to handle 60 rpm for a short time, with not just full gravity but hypergravity. Astronauts do three axis training in experiments like this, to pre-adapt them so that they will be better able to handle an out of control spin like that. Many people can tolerate at least 24 rpm on Earth, for a few minutes. That's the spin rate of the Gravitron, a popular amusement park ride. A study at MIT looked to see if we could tolerate a fast spin rate of 23 rpm for longer periods, an hour a day. They found out that we can, and what's more, you can adapt to it astonishingly quickly. After just five sessions their student volunteers reported far less discomfort in the centrifuge, and had had better co-ordination. "At about this same time (1960), Ashton Graybiel and colleagues began their long series of experiments in the 15-foot-diameter "slow rotation room" at the Naval Aerospace Medical Research Laboratory (Pensacola, Florida). Graybiel summarized their findings in a paper for the 1975 Princeton Conference . Slow rotation rooms offer several advantages over typical centrifuges, particularly in their habitability and in the freedom of movement they afford. Subjects have remained in the rotating room for over a month - not strapped into a seat, but moving about, eating, sleeping, and performing various tasks. Graybiel confirmed that, in general, higher rotation rates resulted in more severe symptoms and slower adaptation, though individuals varied in their ability to adapt. In brief, at 1.0 rpm even highly susceptible subjects were symptom-free, or nearly so. At 3.0 rpm subjects experienced symptoms but were not significantly handicapped. At 5.4 rpm, only subjects with low susceptibility performed well and by the second day were almost free from symptoms. At 10 rpm, however, adaptation presented a challenging but interesting problem. Even pilots without a history of air sickness did not fully adapt in a period of twelve days. At 10 rpm, subjects had to restrict their head movements for several days to avoid severe nausea. Even after the nausea subsided, drowsiness and fatigue persisted throughout the twelve days. Biochemical measurements revealed an increase in the plasma level of the enzyme lactic dehydrogenase." For more about this see Could Spinning Hammocks Keep Astronauts Healthy in Zero g? The main thing we learn from these experiments is that there seems to be a lot of individual variation, and also possibility for gradual adaptation to higher spin rates. What is the situation in space though? Is the situation similar to these ground experiments, or do humans in artificial gravity conditions in space tolerate spin rates better (as the Skylab litter chair experiment might suggest) or worse? This can't be exactly simulated on the ground because you always have the extra component of full Earth gravity acting, usually at right angles to the axis of spin. The Soyuz tether spin experiment would give us our first ground truth for the many experiments done on Earth. We could compare the effects on human physiology and discover whether or not these ground experiments can accurately predict effects on humans in space conditions. The length of tether you need for a given level of artificial gravity depends inversely on square of the spin rate. For instance, at 9 rpm, you can get full gravity with a tether of only 11 meters long. Let's take the same delta v at the Soyuz end as before, of 15.6 m/second. You can achieve full gravity with a radius of 25 meters and 6 rpm (using SpinCalc). The final stage would then be 75 meters from the center of spin, giving a total length of tether of 100 meters. This is 100 meter tether and 6 rpm, crew at 12.5 meters from tether centre which gives full gravity for the delta v you have available in a normal Soyuz mission to get to the ISS. The 6 rpm is a rate that can be tolerated by people with low susceptibility to the effects long term in rotating rooms so may be okay in space also. In the terrestrial experiments they took one day to adapt to this spin rate - so you could try them in spinning rooms at 6 rpm on Earth to see if it helps pre-adapt them to space conditions (but it might make no difference because of the differences). So, if you test the astronauts first - if everyone can withstand 6 rpm on that particular mission you could try this experiment. Joe suggests that, if we want to do different levels of artificial gravity like this, the cable could be designed with strong but releasable tie downs at several shorter tether lengths. You could start with a 100 m tether, and a gradual spin up during the first few orbits, over several hours, getting data on low gravity at fast spin rates. Eventually you get to full gravity at 100 meter tether and 6 rpm, continue at full gravity for as long as the humans can tolerate easily or as long as you want to do the experiment. Or indeed, you could start as short as 50 meters. If it turned out that the crew could tolerate 8.5 rpm in space conditions (still less than the 12 rpm of the Skylab astronauts on their jogging track), a 50 meter tether could supply full gravity. Then use the releasable tie down to go into the next phase of testing partial gravity, at a longer tether length and slower spin rate, but same delta v.
You could continue to test several tether lengths at the same level of delta v around the centre (tangential velocity) - and varying rpms. E.g. half gravity, then Mars gravity, until you reach lunar gravity. The experiment ends with lunar gravity and 1 rpm, which may help with process of adaptation to zero g. It might just possibly help with the early days space sickness. If it's a one off experiment, you might target many different spin rates and levels of artificial gravity, to get as much data as you can about human tolerance of spin rates and health benefits of different levels of artificial gravity. But it could become routine that this is how Soyuz is always done. It does have advantages expecially the targetted re-entry of the final stage - and possibly helping with adaptation as well as being an interesting experiment for the astronauts too. If so, you could do many experiments and try longer periods at any of the gravity regimes and try them out on many different astronauts and explore the amount of personal variation in spin tolerance, and health benefits of artificial gravity. A possible future addition might be to add capability to reel the tether in so that you can try many different spin rates and levels of artificial gravity for any given level of delta v around the spin centre. I asked him about this, what if, say, some of the atronauts just can't tolerate the spins at all (some people are far more sensitive to spins than others) or some issue comes up so you need to break off from this stage of the experiment, and proceed to the ISS as normal just boosting the Soyuz directly. He didn't see a problem. The main thing is that you lose targeted re-entry of the booster. But unless this happens really early on, it ends up with its perigee in the southern hemisphere with 1/8 of the world's population (and large areas of open sea in the Pacific). Bear in mind that the Soyuz as it is now doesn't have targeted re-entry of the final stage - it continues to orbit for a few days until you get re-entry at some reasonably random point in the northern hemisphere. In any case, the third stage re-entry doesn't seem to be a major issue. It's more like it's a nice bonus if you can do a targetted re-entry - as far as we know. Usually nothing survives to the ground, as far as we know. Occasionally spherical objects (less likely to burn up) can survive, as in a spherical fuel tank that survived all the way to the ground in Namibia. One of the few objects to survive re-entry. Spherical fuel tank from a Delta 2 rocket second stage, a similar spherical fuel tank was found in Namibia recently. This is something that can happen. Joe Carroll says it's happened to two of his tethers so far, SEDS-2 and Tips. He says you get a better safety margin with a seat belt type tether, which is what he uses for his more recent tethers wherever possible. You can also have multi-strand tethers for extra safety margin, so long as you have a way to keep the strands apart. The worst case is if the tether breaks at a point in the spin where the Soyuz extra delta v is in the opposite direction to the orbit motion. This would reduce the orbit of the Soyuz and increase the orbit of the final stage. Worst case of all is if this happens towards the end of the experiment. That gives a tiny chance of the third stage boosting all the way to the orbit of the ISS after the cut. Since the third stage is so much lighter than the Soyuz, it could get all the way to the ISS after a cut. The Soyuz is launched with more delta v than it needs, to take account of winds and minor variations in performance of the boosters. This margin is enough so that even if the break happens at the worst possible time - at the end of the experiment, and with the Soyuz moving backwards in its orbit relative to the centre of gravity, still, normally you will have enough fuel left to get to the ISS. As soon as you go into orbit you'd know how much margin you have left - so you can decide then what to do. If you have used most of your margin, you could do a reduced experiment or omit it altogether. Or you might decide to continue anyway, depending on how important you think the tether experiment is. The chance of a break, say due to orbital debris, within two days is tiny - especially if you use a broad "seat belt" type tether - and the chance of that break happening in the worst possible position in the spin cycle is even smaller. The mean loss of delta v is half the worst case. The very worst case, if you have to abort, is that the Soyuz has to return to Earth early and can't make it to the ISS. None of this is endangering astronaut lives, you have this as a built in safety mechanism, to keep the whole process very safe, like the rest of the Soyuz launch system. This is an unlikely scenario but of course you'd need to look at it and make sure it's not hazardous at all in a safety review of the experiment. You could also choose to launch on a day that gives you more time to catch up with the ISS to have more time for this experiment. If you get a tether break in the earlier parts of the experiment, then even if the break sends the final stage all the way up to the ISS orbit - it will take days to catch up, and the ISS can avoid it easily. The worst case is if you get a break right at the end when you are close to the ISS. However, you can do something to minimize this possiblity. You can use trajectory biasing - put the assembly into an orbit with enough inclination so that it's (say) 9 km away from the ISS orbital plane at its furthest point. This requires only 1 m/s of extra thrust to get back into the ISS orbit again after the tether release,, and adds only about 3 kg of extra fuel for this maneuver. If you do that, the assembly, and anything in the Soyuz plane "slaloms" back and forth relative to the ISS plane and spends only 1% of its time within 140 meters of the ISS plane. So most of the time, if the tether does break, even at worst point in the spin cycle, still the final stage misses the ISS. The worst very low probability case is that the break happens at a time when the resulting orbit has its apogee within 140 meters of the ISS plane and at the same time, the final stage is moving along the direction of the orbit. This is a tiny probability occurrence - tether break at particular points in the orbit as well as particular points in the spin cycle. But it could happen, all the same. There is nothing you can do about that possibility - and if it happens late in the experiment when there is enough delta v in the spinning assembly,the final stage could end up heading directly for the ISS. So, then the only thing you can do in that case is to warn the ISS to prepare for it. You are already in line of sight communication with the ISS once you are within 4000 kn. A final stage in rogue obit here is traveling pretty fast, high velocity but not hypervelocity. You'd have about 7.4 hours (rate of approach if break happens then is 150 m/s, 335 mph). You'd also have direct line of communication with the ISS once you are within 4000 km (and also of course with the ground). So for instance, if break happened at distance of 4000 kn, that gives you enough time to warn the astronauts to get into a safe shelter. The astronauts can use the TMA as a safe shelter if there is a risk of debris hitting the ISS, and there isn't enough time to move the entire ISS out of the way to avoid it - as happened in March 2012. Remember we are talking about a tiny probability here. It would have to break at exactly the wrong place in the spin cycle, with the final stage headed along the orbit. It needs to happen at the right place in the orbit to intersect with the ISS orbit at apogee at a point where the distance from the orbital plane is less than 140 meters, 1 % chance of that if everything else is exactly right. However we don't want even a tiny chance like that of hitting the ISS. So, here is how to make sure it can't happen. The ISS can change orbit to avoid a hazard so long as it has at least 20 hours of warning for its DAM system (Debris Avoidance Maneuver System). The new PDAM system gets that down to 140 minutes for predetermined maneuvers - but unlikely we could have predetermined avoidance for all the scenarios of tether breaking. 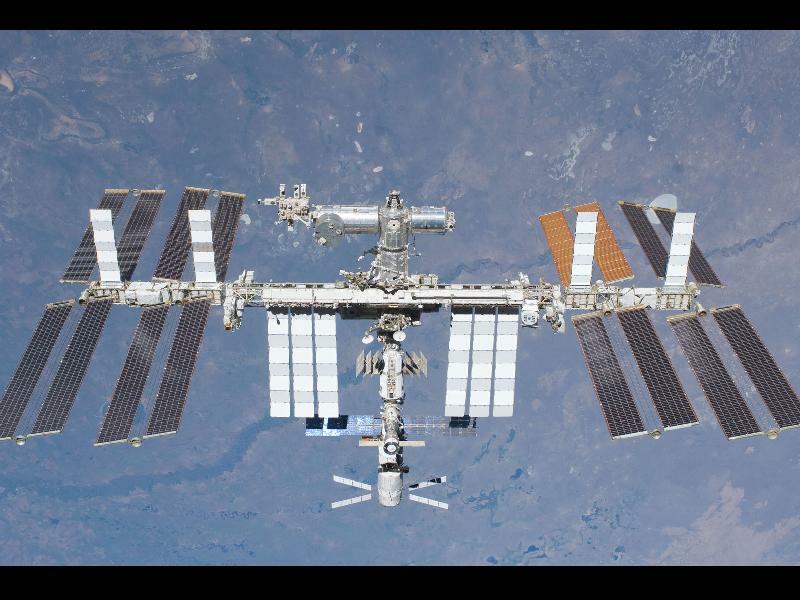 NASA - Current ISS Configuration - it can change orbit to avoid a hazard if it has at least 20 hours of warming. So the idea is - to stop the experiment a little early, with controlled tether release at a time when you are still far enough away from the ISS in the phasing approach so that there is no chance at all of catching up with it within 20 hours, no matter what orbit the final stage went into in an accidental tether break. It would probably be enough to stop the experiment at a 10,000 km approach distance - you would need to work it out in detail of course. Releasing the tether so far from the ISS reduces the time you have for the experiment of course. But if that's what you need for safety, that's what you have to do. You can add extra time at the beginning of the experiment however, if you need to, easily. The idea is to do two laps of the ISS. First time you lap it at a low orbit of 225x250 km, where your rocket will lap it every 1.8 days. At this stage you can do experiments with delta v low enough so that there is no possiblity for the final stage to get to the ISS orbit. This would also be a good time to do experiments with the shorter tethers, for reasonable amounts of g with low delta v.
Then as soon as you overtake the ISS, and got far enough ahead so that there is no longer any chance of a detached final stage hitting it within its 20 hour notification period - then you can start spinning up and boosting to the 225x353 orbit and higher delta v as before. Finally, stop the experiment in plenty of time to keep outside of the ISS's 20 hour debris avoidance maneuver time window. That way you get to do your faster spin experiment for three quarters of your original lap - instead of your 2.7 days for the 225x353 orbit you'd have pretty much exactly 2 days. Still, that's a reasonable enough time for the experiment. Pending safety review of course, tentative conclusion would be that the experiment can be made totally safe. Please note, this is a conversation I had with Joe Carroll via email, written up as best I could, but is no more than an informal presentation of his ideas, to give a rough idea of what he has in mind. Hopefully it stimulates discussion and ideas. And if this got you interested, I recommend you listen to him talk about his ideas in on the space show webinar this Sunday, 25th May! See the Space Show newsletter for details. See also, Ingenious Idea: Soyuz Crew in Tether Spin On Way to ISS - For Artificial Gravity - Almost No Extra Fuel - and for discussion of another possible low cost way to explore artificial gravity, see Could Spinning Hammocks Keep Astronauts Healthy in Zero g? If you are interested to find out more about artificial gravity, and the history behind it, and many ideas that have been explored, a good starting point is Theodore Hall's artificial-gravity.com, with his doctoral thesis on-line and many other papers by various authors on artificial gravity.